my mother's wasp nest, found in a drawer wrapped in paper. she knew the important things when she spied them. 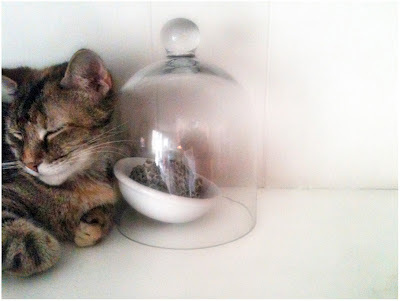 her cat, now mine, happy asleep smiling, pushing hard against the glass that keeps it from her, pushing, pushing as close as she can get, and good enough; they sprawl lopsided lazy together across the shelf. iphone. earlier this year. pink shadows. i told someone today that i'd been absent here because august needed me more than i needed words. truth. but i begin to feel their pull in the late hours of night when outside the darkness is still and filled with cicadas still singing and tree frogs ditto, when the inside is still and filled with only the swoosh of the fan and the muted hum of the air conditioner and russell crowe on the silent tv. yes. yes. i feel the words beginning to whisper in my ear. i love your words. they add threads of beauty, poetry, to the world. i love, love, love this photo, love that she sleeps against it, perhaps wanting to play with that nest, perhaps knowing it belonged to your mother. perhaps both. this photo says the nest is safe and skye cat is safe and content and not in a whisper but a sentence said right out loud. Those pink shadows and those whispers... love that you shared this. ..august needed me more than i needed words. that speaks volumns in itself. i love that your mother had a wasps's nest, and that you recognize it as important. i collect wasps nests and hornet's nests - creeps out my children, but hey. selfishly glad the words are tapping you on the shoulder. this is a marvel in word and image !! I love that kitty, and I love that she is snuggled up against something that belonged to your mother. I just want you to know that I stubbled across your blog about 8 months ago and have enjoyed visiting it ever since. As my mother would say "she has a way with words". So happy you are healing and hearing the whispers. Hold them close, they are dear.